You are here: HomenextTopicsnextSportnextGreyhound Track - Old Mill Lane. 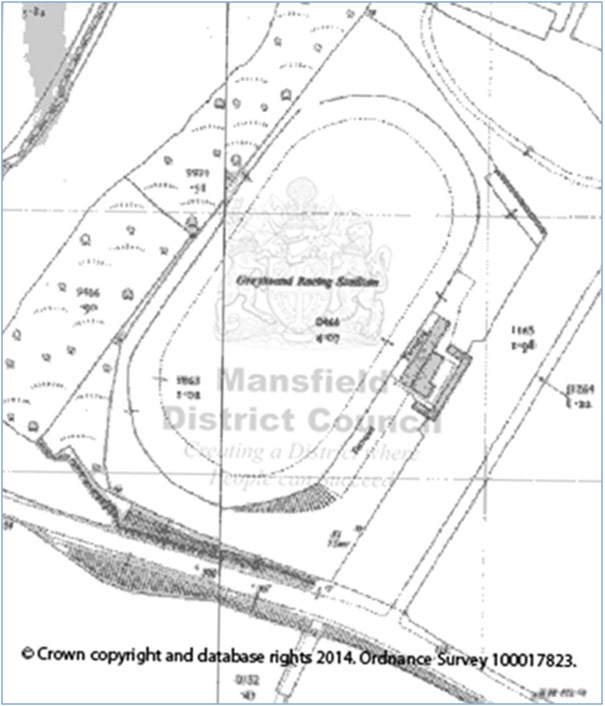 While looking at some older OS maps I came across a greyhound track of which I had no knowledge of. The date of the maps was 1955. A earlier map of 1938 displayed an empty site. I hope to eventually find some more details about the track. Dog racing must have been a popular spectacle with a track at Sutton in Ashfield which was the replacement for the track at Field Mill which ran from 1929 to 1931. This track must have fulfilled a need for another on this side of Mansfield. The track was where the site of the Tall Trees Mobile Home Site, Old Mill Lane, Forest Town is now. The Map shows where the buildings and terraces were on one side of the track. I hope that this image might bring back some memories before they are lost. With acknowledgement to Gavin Campbell GIS & Web Development Manager for Mansfield District Council, for help in producing the map. As a lad, myself and friend Eric Cookson, son of a local policeman, used to watch the dog racing where the corrugated sheets were clear of the ground, we were usually chased away but later we learned to mention Eric’s dad at the turnstile and were allowed in free of charge. In later years I watched motorcycle grass track racing there with my parents. Sid Mintey was the star rider, he was the English champion, a local man, his main rival being Goodacre. Did they ever hold motorcycle races at this track as my Father told me he raced at Mansfield Woodhouse Stadium? 1950s and 1960s – I used to pal about with Armstrongs who had greyhounds – Ernie Amstrong thought there was a lot of cheating at the Woodhouse track and during one race he ran on and kicked the hare off – it closed just after that. Details about this track seems hard to come by. However, I have been told that corrugated sheeting was put all the way around the track. This would provide privacy and viewing the racing was only for paying punters and onlookers attending. The Mansfield and Nottingham newspapers seem not to give the results of the racing there or for the track at Sutton-in-Ashfield. Just above the mobile home site on Old Mill Lane, there is a large rusted metal gate and an overgrown track, I have often wondered about this, but looking at the map I now suspect it was the way into the Greyhound track. I remember the track well, after it closed they tried Harness Racing[Trotting Horses with light frame carts] like the sport in the Southern States of the USA. It didn’t catch on and became a caravan site and residential vans.